The History of the Class Painting project is one of the longest held traditions at the Academy dating back to 1974. In 1974, Rick created "Dawn Patrol Solo". The class commissioned him for the painting and gifted it back to the Academy. Thus starting the Class Painting Project. Over the past Four plus Decades, Rick has continued to capture the spirit of almost every class on canvas. 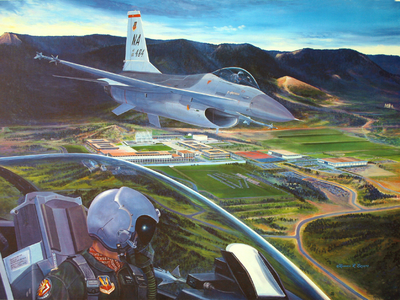 He has created arguably the largest most valuable collection of Air Force Academy art commissioned by one artist. His work inspires and captures the beauty and wonder of flight. Although the paintings are similar in some fashion, they are 100% unique to each Class and the Academy. He is known for hiding elements in all of his paintings. This is his trademark along with his creation of the Starlite Original. For those that own one of Rick's works, they will all tell you. "The Class Painting is one of my most prized possessions". Graduates dating back to the first to classes proudly hang Rick's work on their walls. From 2LT's to 4 Star Generals, Rick has undoubtedly made an impact with is creations.